You are sitting in a conference room attending an interesting presentation. Unfortunately, there is an irritating, extremely obnoxious black mark on the projection screen… created by some genius who used a permanent marker on a projection screen… (you will never know his/her name). That black mark is interfering with the presentation…. What happens next? Very soon, your stop noticing the black mark and start focusing on the presentation. Technically, your eye is viewing the unwanted black mark. But practically, it is simply not aware of it. That is called Inattentional Blindness. This “blindness” or automatic masking is not limited to vision. Any input can be masked if you are not interested in it. Every day we see Office tools. Each one of them has hundreds of buttons and options. Do we see all of them? Yes – the light reflected from them is reaching your retina. But do we notice and understand them? Absolutely not. Because of Inattentional Blindness. Everyone suffers from it. Nothing wrong with it if the items you ignored were irrelevant and useless. Unfortunately, what you are ignoring is immensely useful to you. There are three things which we don’t notice even if we are using the button associated with it. Here is the button to create a New Slide. All of us use it. But we miss the dropdown below it. This is a dual function button. 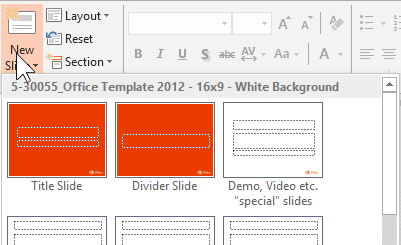 If you want a slide with the previously used layout, click on the New button directly (upper part). If you want to choose the type of layout for the next slide, then open the dropdown (click on the lower portion) and choose. These small little buttons at the corner of a group invoke related dialogs which provide more options. We never notice them. Buttons near to the ones you are using are obviously related to the task at hand. So it is a good idea to notice them and ponder about what they do. Stay on them for just one second to view the tooltip which shows what they do. Little bit of curiosity and exploration is all that is required to widen your sensory horizon and become more efficient! Test your efficiency. Try any of these simple tests. Each test asks you how to do a particular activity. In ALL these cases, you will already know the answer. But is that the most efficient way? Check the most optimal method and learn from it. 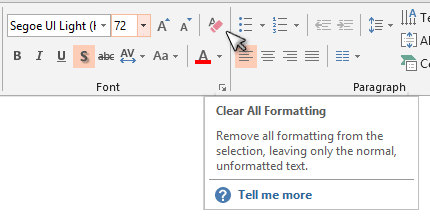 Previous PostHow to edit a formula in ExcelNext PostIntroducing PowerPivot – do you need it?